Most understand that it’s a lot less expensive to remain living at home, compared to the cost of living at a seniors facility, but there’s a hidden risk that’s not as well appreciated. The strategy I frequently hear is “We’re going to stick it out here at home until we can’t get around this place. We’ll save money by not spending any more money here, and defer the extra cost of a seniors facility as long as possible, and by then, we’ll have saved as best we could and it won’t really matter anyway.” Sounds like a rational business case for aging in place, and a strategy that fits well with a generation who knows better than most about how to save money. The underlying message in there is that they never actually know what they’re saving and they’re prepared to let go of their lifestyle for an uncertain number years. If they encounter a health event sooner than hoped and live a long life after giving up their home, that also means they will hand over a big chunk of their equity to a seniors corporation. For some, this results in total equity depletion and being moved out of their facility and into a Medicaid program. It’s a very big risk, for very little reward. Having something to look forward to is foundational to being human. We all matter, every day, without exception. Sure, there are aspects of aging that aren’t very appealing, but we’ve all lived life based on setbacks and recovery. To hope is to be human, to feel alive, and that shouldn’t end at some medical event. To assume one would be happy with the notion of giving up their home at 75 and living into bankruptcy for 20 years a seniors facility is unfathomable. What if we put some numbers against various strategies? At least then, we’d be starting to take some control of our future and not leaving it to chance. It is helpful to focus more on preserving equity and less on cost. (Your financial advisor will be a strong advocate on this point.) As soon as people take an objective equity viewpoint, often the picture looks very clear. You can safely assume that a seniors’ facility with modest support, meals and maintenance will run close to $100,000/year for an 850 sqft 2 bedroom unit. Let’s also assume that today you’re in a lovely 4,000 sqft home, given modest home care support, had 2 meals/day prepared for you, and your home maintenance was fully managed for you — just like in a seniors’ facility. The cost to live at home with everything provided would be about $25,000 less per year with no drop in lifestyle. The annual savings are meaningful, and depending on your financial position, could be very important down the road, but there’s much more to this. What if you reallocated $100,000 of your investments from retirement savings into your home to make it bulletproof for aging in place. For that money, you could put in an elevator for full home accessibility and do a complete bathroom remodel of your master bath with things like a designer curbless shower and wheelchair access vanities if needed later. Remember, the investment in the elevator and bath aren’t expenses, they are equity reallocation. They will both result in increased home valuation. A modest expectation would be that your home value increased by $75,000, since it is now ready for the #1 growing market – baby boomers looking for an age-friendly home, who are realizing they are VERY HARD to find. You don’t need to worry that you didn’t get full dollar-for-dollar return on your equity, since you saved that immediately, as soon as you didn’t have to move. Every year after that, it’s money going to your pocket, instead of the retirement corp.
Another financial bonus is that the annual savings gets better every year. The regulatory obligations for seniors facilities has been rising steadily and as result, the cost of seniors’ housing is running at about 1.5 times the rate of inflation. Once moved in, there will be few options for residents to control future cost escalation. 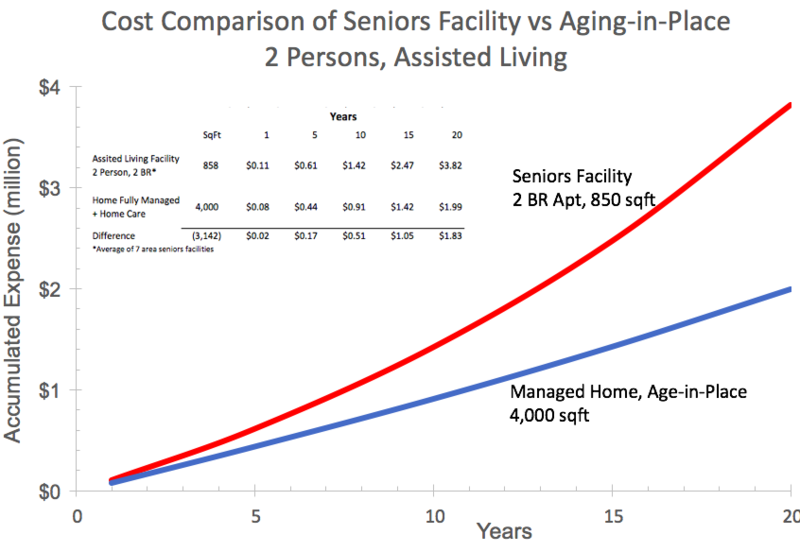 The chart above was prepared to help a couple understand economic comparisons of getting full maintenance and home care in their own home, versus moving to a seniors’ facility. The cost and equity benefit was very compelling. They could expect to preserve about $1,000,000 of equity over 15 years (including their home improvement). For those living in a smaller home, the benefits would be even more toward remaining in their home. We have the capability to prepare a detailed financial analysis for clients in our service area. We encourage clients to get their financial advisor involved as well, as they can help answer many questions and confirm what would be in their financial best interest. What to get your parents for their next Birthday or holiday?